Want to sleep on the side of a mountain? Do you dream of adventures in your sleep? Skylodge might be the place for you. It’s a place where, while you are dreaming, you’re living an adventure. 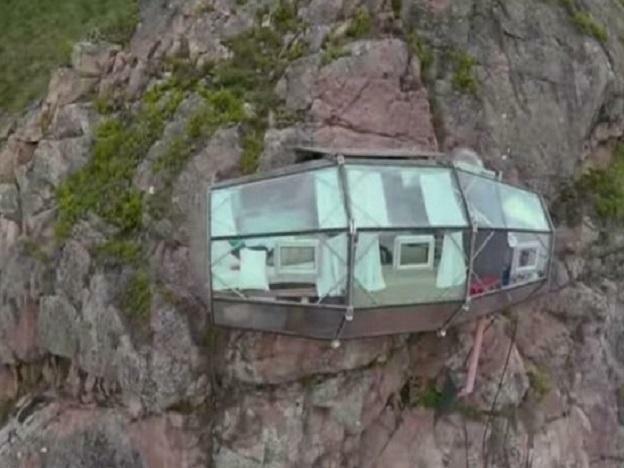 Suspended nearly 1,000 feet high in a luxury cliff-nest, a night of sleep in one of Skylodge’s “hotel rooms” could have you thrilled, or ready for a helicopter rescue. Over the last month, Skylodge of Cusco has been mentioned in Huffington Post, Slate, Inhabit, Gizmag, Travel Starter, the Daily Mail, among other acclaimed portals. But what these magazines and newspapers can’t get straight is whether or not it’s the most terrifying or the coolest hotel in the world. The hotel is owned by Peru-based tour company Natura Vive and is located in the Sacred Valley of Peru. In order to sleep there, visitors have to climb 400 meters of Via Ferrata or hike an arduous trail through ziplines. They offer rooms with four beds each and are completely transparent to give their guests a genuine experience of the Peruvian Andes. Within only one year their services were given an A+ by tour operators according to their website, and they have been open since June of 2013. So, what do you think Living in Peru readers? The coolest or the most terrifying? This article was brought to you by Inca Rail, a rail company that offers a smooth ride to your next adventure.